Northlink College played host to the second annual Further Education and Training (FET) College Achiever Awards on Monday, 18 February 2013. This event is held annually to celebrate the achievements of the students from the six Western Cape FET Colleges and include: Northlink College, College of Cape Town, Boland College, False Bay College, West Coast College and South Cape College. The Awards are given to the top achievers of the National Certificate (Vocational) and Report 191 courses offered at the six Colleges and each of the 13 categories had a winner that was announced on the evening. These categories included business studies, services, engineering, IT and mathematics. 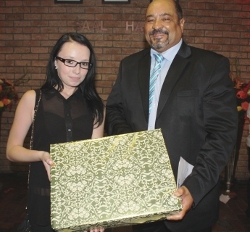 Stephanie Boonzaaier, ex-Northlink College Legal Secretary student from the Parow Campus, not only won her category but walked away with the coveted Premier’s Award for Report 191 (N6) courses. The winners of these prizes and awards must have completed their course and finished with, as least, an average of 80% and more in business studies and 75% and more in engineering studies and mathematics. Stephanie Boonzaaier exceeded the 80% benchmark by attaining an average of 89.5% which is a great achievement. “You are all set for greatness as you have overcome many odds,” said the Premier of the Western Cape, Helen Zille, during her keynote address at the FET College Achiever Awards. Northlink College would like to congratulate all the winners and look forward to seeing what impact they will have in South Africa in the years to come.